No matter what your age or generation you identify with, if you work in a creative field like design or architecture, you are part of a team. It doesn't matter if all your team members are working under one roof or if they belong to different companies or disciplines. Design is a team sport. Architects, engineers, interior designers and other consultants who participate on design projects are used to this type of work environment. Any one discipline is dependent on the others for information to complete a project. Each team member has a specialty that is leveraged by other disciplines to move the project forward. Each member needs the other to complete their parts in a timely manner so the project stays on schedule and conforms to the scope of work that the client is paying for. Sounds simple, doesn't it? In theory, it is. But the fact is not all teams are structured to be this way. The teams that have limited leadership or no coordination have problems. If design is a team sport, then the best teams have great managers and coaches. This is truer today than ever before, because never in our work history have we had so many different age groups working together with different ideas on how to collaborate. The team manager's job is essential to getting the team organized. Every generation has its way of doing things, especially when it comes to designing the built environment. Collaboration styles are just as diverse. Many designers who are tech savvy work with designers who are not, and they sometimes can't understand how anything was designed before the internet. The reverse is true for those who are not as tech savvy. They wonder if there is any real thought that goes into the design, because they seem to be automatically created by a computer program. This frustration from all sides is real and can destroy not only projects but also design teams. Generations have always been at odds with each other. It goes without saying that each one has had at one time a chip on their shoulder, challenging the other to knock it off. As designers, we are not immune to this type of behavior. Sometimes, this is in jest and fun, but sometimes it be can be seen as bullying or harassment. Collaboration across generational lines is tough. It takes a dedicated team to be able to negotiate the design process so that everyone who is participating feels valued and engaged. If our clients are an active part of the team — and they should be — they need to know that the team is doing its job as efficiently and professionally as possible to bring the most value to their investment. What are these collaboration difficulties that seem to pop up out of nowhere? Why do they always seem to be related to our age? Technology is at the of heart of the issue. 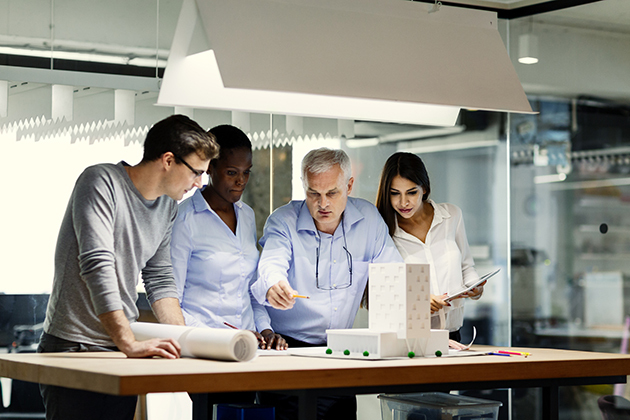 Many architects, designers and engineers who have been working as professionals for at least 25 years have seen just what technology can do to good collaborative teams. In the early years of technology, it was difficult to share files, the internet wasn't always readily available, and computer drafting programs were not sophisticated when it came to drawings — especially creating 3-D realistic renderings. Hand drawing was still more popular among certain design and engineering disciplines. As technology advanced and younger designers and engineers were coming into the profession, they wanted more technology than less. The "old way" of doing things seemed to be less important. But the design process still is the same. The process of sharing ideas to build a cohesive design is still done the way it's always been done, regardless of the technology that is currently being used. Collaborative teams need good managers to guide the design process. Technology is only one aspect of collaboration. If the team ages range from 60-20, the ideas that can be generated have the same wide range. When the client is present during the design process, it can be a blessing or a curse. Although getting a client's input during the process is beneficial, it can also throw the team off track if the client's scope keeps changing. Having a manager who is working as a resource for the client and the team can help keep the collaboration channels open and the team on track. Regardless of age, anyone who is on the team has a role and a set of tasks that need to be completed in a timely manner — that includes the client. If communication is open and ideas are easily shared, it is less likely to be a problem. Everyone who participates has a sense of ownership and is more likely to agree and disagree without disrupting the project's flow. Knowing how each generation "grew up" in their field of design or engineering expertise is a plus, but not necessary to having a good team dynamic. Just knowing that each member, regardless of age, may have a different way of working is enough. Letting them express what works for them with the team is good, but it shouldn't dictate how others on the team do their work. Good managers know how to leverage it to the client's advantage. Just like a good baseball manager knows which player to play in each game throughout the season, a good project manager for any design team knows how to access the best talent regardless of how old they are. In the end, the client needs to know that they have the best design team available for their project — a team that knows how to bring great ideas together with collaboration and expertise, but not defined by age.